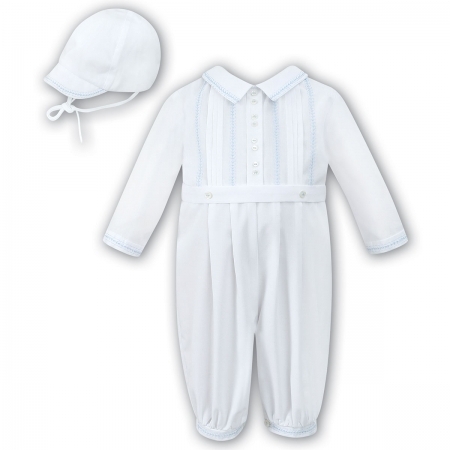 Beautifully made baby boys long sleeved white romper with hat. The front is pleated down and decorated by vine pattern in blue thread and double buttons. Matching vine pattern with blue thread on cuffs and hat. Use for christening and special occasions. Buttoned at rear and at groin. Fully lined. Made with quality 65% polyester 35% cotton material. This baby boys blue romper is available from stock in our shop. We are a proper shop in Ashford Middlesex. Please come and visit us if you live near by. Please note that this romper has bigger and longer cuts than average. Please see measurements below.